The best thing about Halloween besides the costumes is the treats, so it's a trick to satisfy a sweet tooth without too much added sugar. Try these great ideas for fun, healthier alternatives that your kids will love! 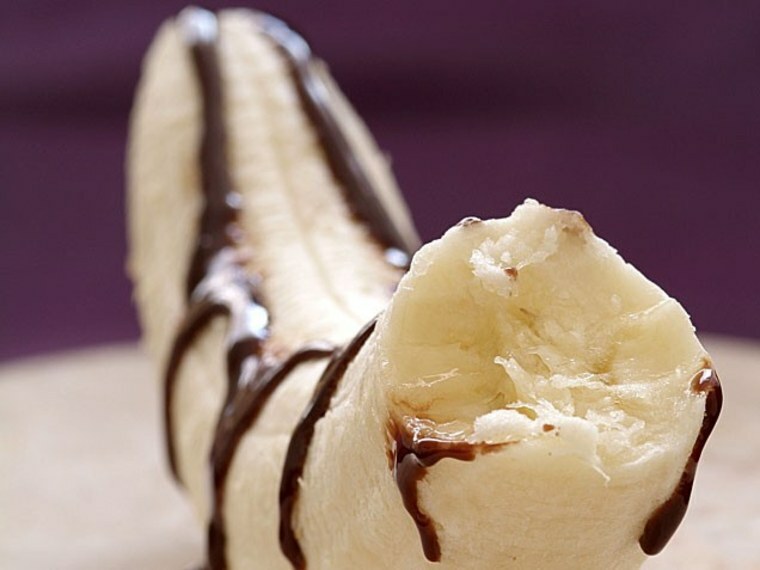 Frozen banana-chocolate treats are not only delicious, but they're fun to make with your kids, too, says Mitzi Dulan, R.D., co-author of The All-Pro Diet and owner of Mitzi Dulans' Boot Camp. Place unpeeled bananas on sticks and freeze them. Once they’re frozen, drizzle with a little melted dark chocolate and serve. “You are getting some fruit while also enjoying chocolate,” says Dulan. They’re great for adults, too. “The flavonoids in dark chocolate provide antioxidant properties,” says Dulan, which are believed to play a role in preventing chronic conditions, like heart disease. A classic! And, they have less sugar than you might expect. For a healthier version, Julie Negrin, a kids’ cooking instructor and certified nutritionist, suggests using brown rice puffs, which come from whole grains, as well as brown rice syrup as a sweetener, which won’t spike blood sugar as quickly as refined sugars. To add some Halloween spirit, let your kids decorate the warm bars with Sun Drops (an all-natural alternative to M&Ms). Whether you use carrots or pumpkin, these cupcakes will be a healthier alternative to the store-bought chocolate (or vanilla) versions. “Orange foods such as sweet potatoes and pumpkins are nutrient dense in vitamins, minerals, antioxidants and carotene,” says Negrin. “Any time you eat colorful real foods, they are providing important nutrients.” If you’re using canned pumpkin, make sure it’s 100 percent pure with no additives like salt. Better yet, use a fresh pumpkin. Cut it in half, bake it, and scoop out the pumpkin. For a Halloween theme, let your kids decorate the cupcakes with raisins or dark chocolate chips, Negrin suggests. Both chocolate covered strawberries and fruit skewers with a chocolate dip are fun, healthier treats, especially if you stick with good-quality dark chocolate which has less fat, additives and sugar than more processed chocolates. “This way you're having actual fruit from nature with its fiber -- which kids don't eat enough of -- minerals and vitamins,” says Negrin, also author ofEasy Meals to Cook with Kids. Fiber can keep you full and help with digestive issues such as constipation (among others), she says. To prevent injury, steer clear of pointy skewers if you have a very young child; stick with the strawberries or larger chunks of fruit instead. Honey popcorn balls, made with popcorn, honey, butter and salt, will definitely be a child pleaser. "This is an excellent option because you can make it with real foods," says Dulan. "Honey is 100 percent pure --just one ingredient -- and you can pop your own popcorn. You can get some fiber from the popcorn and since honey is slightly sweeter than other sweeteners, you can use a little less." To add a Halloween touch, add raisins or natural orange food dye to the popcorn balls. Keep these treats away from kids under 4, though, as popcorn can be a choking hazard. This lunch classic is easily transformed into a spooky treat. Once prepared, cut the sandwiches with ghost-shaped cookie cutters and use raisins to make the eyes. “I'm a big huge fan of peanut butter and jelly. It's the most amazing food ever,” says Negrin. “It has fat, protein and carbohydrates all there naturally -- the three macronutrients needed every day. It's a great meal to balance blood sugar.” To further boost the health factor, use whole wheat bread. Don't throw away the seeds after carving a pumpkin -- they make a great snack. “This is one of my favorites to do with kids,” says Negrin. “They love it and say it 'tastes like popcorn.' Clean and wash the seeds, toss in olive oil, sprinkle with a pinch of salt and bake at 325°F until toasted, about 15 minutes. Stir the seeds while baking to prevent burning. Pumpkin seeds are not only a good source of heart-healthy unsaturated fats, vitamins and minerals, says Negrin, but they are also high in fiber. Put the seeds in fun, Halloween-themed bowls for your kids to eat. These treats are fun for kids, while upping their daily intake of vitamin-packed fruit. Besides dipping whole apples in caramel you can also chop up the apples and put the caramel on the side. It's more interactive for kids this way and some kids may not even touch the caramel!“ This is a great option as you can get a good dose of fiber,” says Dulan. She recommends buying organic apples when possible, since apples top the list of fruits and vegetables with the most pesticides. These may be just as tempting as candy corn, but actually contain some good stuff. “Your palette is enjoying it as a treat but you are getting something real out of it,” says Negrin. “Raisins are a great source of fiber, vitamins and minerals.” Buy yogurt-covered raisins with the fewest ingredients, ideally only four or five. The more ingredients, the more processed the food usually is, says Negrin. To add a Halloween color twist, add chopped up dried orange fruit -- apricots, mango, papaya -- to the bowl. Jell-O doesn't offer much in the way of vitamins and minerals, but it can be a fun, once-in-a-while treat for Halloween. Prepare a package of orange Jell-O and once it's ready, use Halloween cookie cutters to make ghost and pumpkin shapes. Kids usually have a great time making and eating Jell-O, which can satisfy a sweet tooth while being low in fat and calories. To add some nutritional value to the treat, add pieces of real orange in the Jell-O before it sets.